Happiness: Azza E. architecture poetry: Mary M.
It’s not as easy for me to find high school age poets. So I asked my neighbor. 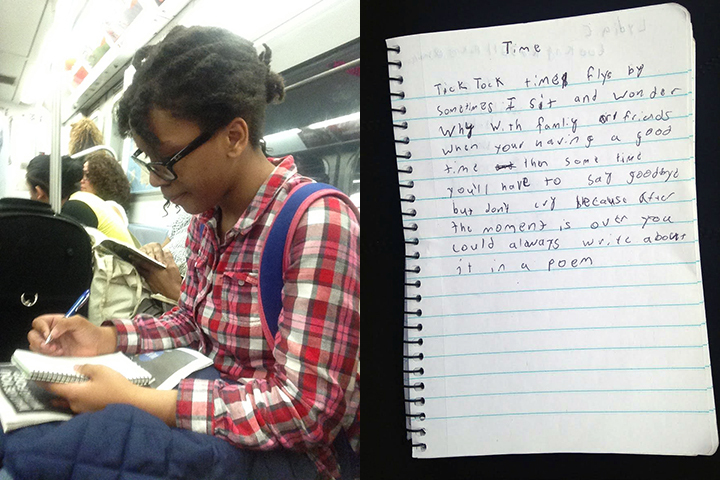 She worked so hard at this poem, harder than almost any poet. I was surprised. She had accepted the task so readily. While she was pondering, I asked, “Are you in high school?” “No.” Wow, she is older than I thought. “College?” “No.” “Middle school?” I was incredulous. “No.” “On my goodness, what grade are you in?” “5th grade.” I was stunned. Dumbfounded. I did not ask her in the same way I would have asked a child. She was extremely mature, thoughtful and intelligent. After the first line she said, “I did not mean to make it rhyme but I discovered a rhyme in the first sentence.” She plays the viola. I will be a bit more careful now with my presumptions about age. Read a poem by Azza E.